GSP (N)/(S) Exit 98 Route 34 South 1 mile to Atlantic Avenue, (approx. 1/4 mile past the Monmouth County Route 524 traffic circle), turn right and bear right on Atlantic Avenue. 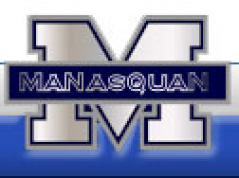 Go to the Manasquan Circle (Route 35). Go halfway around the circle to the 2nd turn-off, Atlantic Avenue (continuation). High School on the Northwest corner of Atlantic Avenue, and Broad Street.